So your leftovers are lukewarm and there are only marginal differences between the temperature of the fridge and the kitchen itself. It’s time to troubleshoot before mold sets in and things get ugly. Here are some quick fixes that should help reboot your fridge and protect you from spoiled groceries. There are various reasons why your fridge might not be cooling. Some of these issues are certainly preferable as far as refrigeration issues go. These are the quick and easy fixes that can be taken care of in an afternoon at the most. Fridge is unplugged/not getting power. If there is no light on when you open the door, this could be the case. The thermostat has been significantly tuned down by accident. The vents on the freezer are blocked. These have to be clear for cold air to circulate through. The coils under and behind the fridge are clogged with dirt and grime from years of neglect. The condenser fan is jammed and cannot spin freely. This can be fixed with a thorough cleaning of the fan blades. Make sure to unplug the fridge before you do. If the fan does not fire back up, it’s time to replace. Your fridge is plugged in and you can hear it working but it still is not cool. This is most likely your evaporator fun. 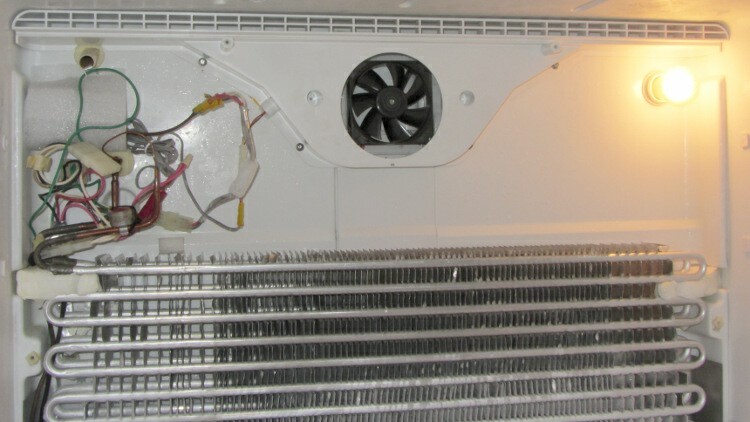 That “fridge is running” sound is your freezer coil system working extra hard to spin a fan that will not move. Your first move is to check and see if cleaning the fan will get it going, as mentioned above. If this does not work, however, it is possible that you will need to change out the fan. You may also hear a squealing sound from your fridge that originates in the fan. This is also evidence that it is on its way out. The fan is located on the backside of the freezer compartment. Remove the cover inside the freezer to reveal the coils. If the coils are completely frozen over take everything out and unplug the refrigerator, letting it thaw out for a day or so. Be sure to lay some towels down to sop up any water that melts off and leads as it thaws. When it is void of ice completely, plug the fridge back in. If it fires right up and cools well, you have a defrost timer problem on your hands. This is a job for a pro. If the evaporator fan works, but the fridge is still not cold, it could be the compressor fan. This is a different cooling mechanism located on the back of your fridge. It comes on when the thermostat calls for the fridge’s internal temp to be lowered. In other words, if you leave the door open for a while, you will hear the compressor kick on. If the fan is not spinning, it will need to be replaced. Remove the cover: empty the freezer to access the cover. The screw holes will be plugged or sealed. These plugs need to be removed so that the screw heads are revealed. Remove the fan itself: with the cover off you will see the coil and fan system. The fan is held in place with a few screws and a cover plate. Remove the screws to disengage the protecting plate first. Then, unscrew those that secure the fan itself. This will come out as one piece with fan and motor attached. Replace: The fan and motor will be replaced, but you will have to reuse the mounting bracket. Be sure to hold onto any hardware that comes off the bracket. Reattach wires and reassemble. Remove the existing fan: depending on your fridge, there may be a bracket that sits in front of the fan to guard it from sucking up any number of things that might jam it up. This will need to be removed first. It is likely attached with a normal screw type or a small nut and bolt set up. Writing: you will need to clip the wires of the old fan. Do so as close to the fan as possible. Strip those wires at their ends and connect them to those that come with your new fan. Use wire nuts to cap the exposed wires and twist. Install new: with the electric done, you can reinstall following the same process as the disassembly. So there you have it: the best possible scenarios if your fridge is not cooling and every minute that passes you are closer to a kitchen full of spoiled food. Follow these guidelines starting from is the fridge plugged in all the way to the compressor fan before you call a pro. It is likely that one of these is the problem and you will certainly be well equipped to take care of it.